"At present about 120,000 Christians are living in Iraq as refugees. They need everything because the ISIS terrorists have taken all they had". In his remarks to the conference participants, Louis Raphael I made a call to set up a protection zone for Christians in Northern Iraq. This should, he said, be placed under a United Nations mandate and should be set up with major involvement of Iraq’s neighbour states. 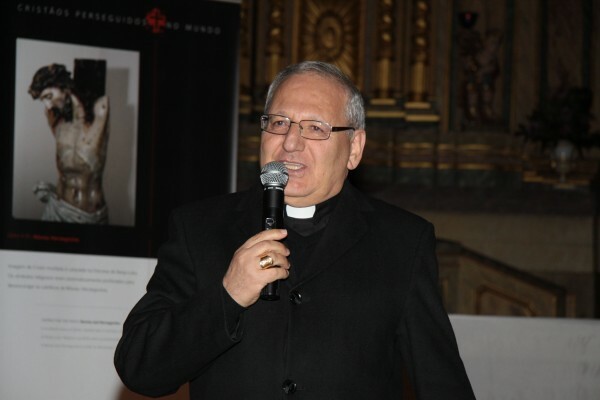 “We need a resolution of the United Nations which will enable us to return,” the Head of the Chaldean-Catholic Church said. Sako warned that if the Iraqi Christians are not able to return to their places of origin in the Niniveh Plains near Mosul, they will face the fate of the Palestinian refugees, who have lived scattered over many countries. The Syriac-Catholic Patriarch Ignace III Yousif Yunan, a resident of Lebanon, also made a call at the conference for a greater commitment on the part of the international community. “With the capture by ISIS of Syriac-Catholic towns such as Qaraqosh tens of thousands of my faithful are fleeing. Aid from the international community would not only help them materially, but also show them that they are not alone and not forgotten.” The Christians of the Middle East were too few and too poor to attract the interest of the industrialised nations, the Church leader continued. The conference “Christians in the Middle East: Citizenship, Human Rights and their Future”, organised by the Vatican representation at the UNO in Geneva and held at the UN Human Rights Council in Geneva, was attended by delegations from the United States, Great Britain, Poland and Austria. Subsequently US Ambassador Keith Harper also received a delegation of Iraqi Church representatives for discussions. Directly under the Holy See, Aid to the Church in Need supports the faithful wherever they are persecuted, oppressed or in pastoral need. ACN is a Catholic charity – helping to bring Christ to the world through prayer, information and action. The charity undertakes thousands of projects every year including providing transport for clergy and lay Church workers, construction of church buildings, funding for priests and nuns and help to train seminarians. Since the initiative’s launch in 1979, Aid to the Church in Need’s Child’s Bible – God Speaks to his Children has been translated into 172 languages and 50 million copies have been distributed all over the world. While ACN gives full permission for the media to freely make use of the charity’s press releases, please acknowledge ACN as the source of stories when using the material. For more information or to make a donation to help the work of Aid to the Church in Need, please contact the Australian office of ACN on (02) 9679-1929. e-mail: info@aidtochurch.org or write to Aid to the Church in Need PO Box 7246 Baulkham Hills NSW 2153.